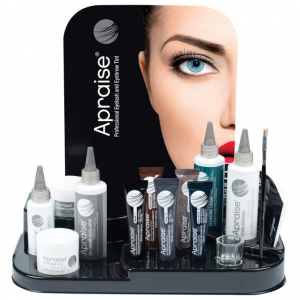 Introducing the NEW Apraise® Lash & Brow Station. A convenient and stylish station that holds all the products required for you to create defined brows and luscious lashes. The Lash & Brow Bar Station is small, lightweight and has integrated holders for Apraise® products, cotton swabs and accessories. This handy station is not only practical but a great promotional tool. It can be placed directly on display and acts as advertising tool to maximise retailing opportunities in salons. Black Eyelash & Eyebrow Tint – No.1, Grey Eyelash & Eyebrow Tint – No.1.1, Blue Black Eyelash & Eyebrow Tint – No.2, Dark Brown Eyelash & Eyebrow Tint – No.3, Light Brown Eyelash & Eyebrow Tint – No.3.1, New Pre Wax & Tint Cleansing Lotion, Liquid Tint Developer, Stain Remover, Petroleum Jelly, Cream Developer, Eyelash Tint Protective Sheets, Dappen Dish (Glass), Tinting Brush, Eyebrow Shaping Wax and FREE Display Unit.